Since 2010 CER has attended and supported the collaboration between Arizona State University (ASU) and Global Silicon Valley (GSV). The annual ASU+GSV Summit is the world’s leading education and workforce innovation summit. 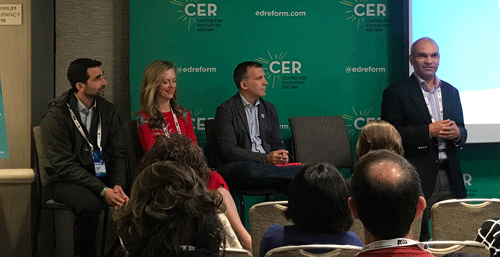 CER will be introducing its new ed tech start up at the Summit, a platform that has the potential to create the most powerful education network in the world! Stop by our booth at Exhibit Space #207 on the second floor to learn more, and watch for a special ASU+GSV attendee code to become an inaugural member as our gift to the ASU+GSV team for 10 years of fabulous inspiration. Reality Check with Jeanne Allen, a weekly podcast weekly podcast series on anything and everything having to do with education will also be airing from our perch on the second floor at the Manchester Hyatt on Tuesday. Come by and give me the answer to some key questions we will be asking innovators of all kinds. If you want to schedule a time to talk ahead of time, write to ram@edreform.com. 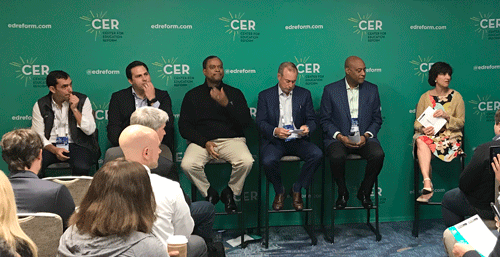 CER’s CEO, Jeanne Allen, is honored to be leading a discussion with education innovators on a provocative topic, An Argument for a Return to Black Schools, starring Patricia Brantley, CEO of Friendship Public Charter School, Washington, DC; Howard Fuller, Director, Institute for the Transformation of Learning, Marquette University, Milwaukee, WI; and Lloyd Knight, Principal, Thomas Carr Howe Community High School, Indianapolis, IN. Join us Tuesday at 10 am in Harbor G, Manchester Grand Hyatt Hotel on the second floor to explore this and other issues these leading innovators and devoted activists face every day. It’s going to be a great few days. We’re proud to be sponsors again, and more importantly, friends and compatriots of Michael, Deborah and the whole ASU team in fostering more innovations to improve the economic well being for citizens here and throughout the Globe. IT’S 5 O’CLOCK SOMEWHERE! CAN EDTECH SAVE RURAL AMERICA? Attendees joined moderator, Jeanne Allen, for cocktails and a frank conversation about bringing 21st century innovations in teaching and learning to Rural Education, to improve education at all levels, and the economic climate as well. Hon. Kevin Chavous, President of Academics, Policy & Schools, K12 Inc. Leaders from the Barbara Bush Foundation, presenting sponsor Dollar General Literacy Foundation, and the Barbara Bush Foundation Adult Literacy XPRIZE Foundation took an in-depth look at the emerging marketplace for adult literacy technology solutions.